It was a long train ride from Sendai to Ise-shi, a first time visit. 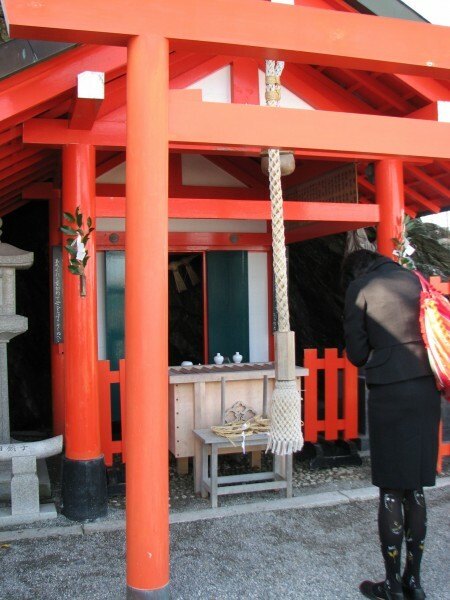 The Shinto shrines of Ise [Inner, or Naiku, and Outer, or Geku] are very ancient. The original ones were built in the 7th century, and first rebuilt in 692. Ever since, they are rebuilt every 20 years. They will do it again next year. They are situated in a beautiful, ancient forest of cryptomeria trees. My friend Aya-san came over from near Kyoto the next morning, and we set off to walk to the Outer shrine of Ise or Geku. At the time, there was only a light drizzle. Unfortunately, as we kept going, the rain increased, to become a downpour. By the time we got to the Inner Shrine, it was a downpour. Since it was Sunday, there were many tourists, and we trudged on, I should say sloshed on, in spite of it. On occasions like this, I always wear rubber soled shoes, carefully waterproofed, as is the lower part of my pants. Of course I had a raincoat and an umbrella. Nevertheless, I got wet. Aya-san's boots had water in them. The stairs to the shrines were real cascades... I couldn't take any pictures, being afraid of ruining my camera. So I guess I will have to return on some dry day in the future. Luckily, the next day was bright and sunny, if windy and a bit chilly. 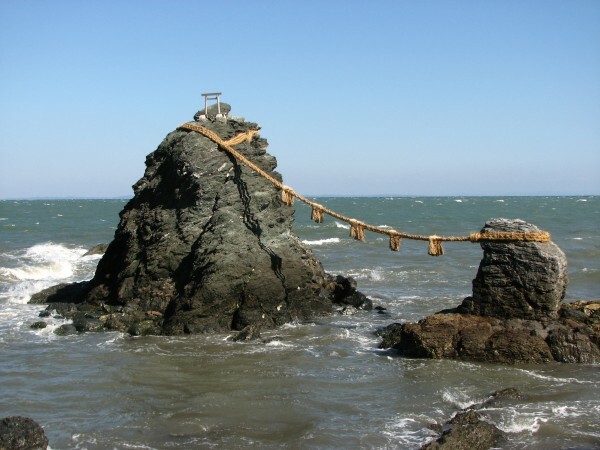 I had decided to go to see Meoto Iwa, the famous "wedded rocks". It is a short train ride from Ise-shi. 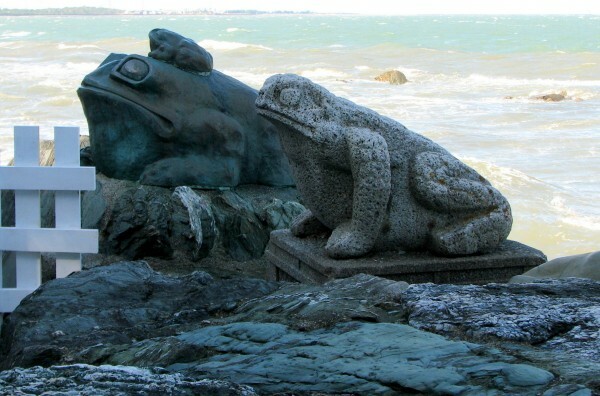 When you arrive at the coastline, though, what you first notice are frog statues. But then, you get a first distant view of the rocks. They represent Inazagi and Inazami, the two gods of the Shinto creation story. 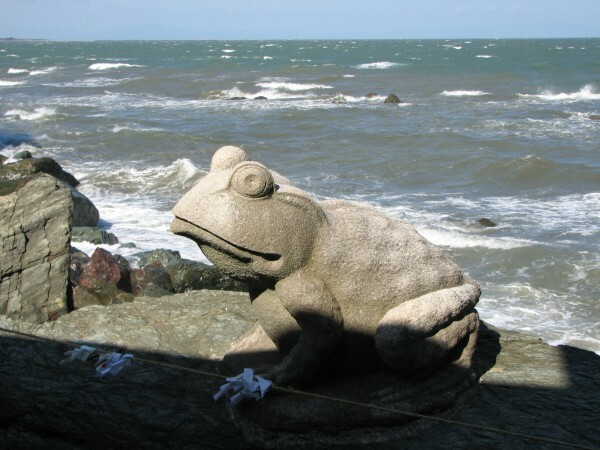 The frogs are a symbol of the Okitama shrine, which is right there, where Miketsu no Kami, the ancient goddess of food, is revered. Believe me, there are more, I just didn't photograph them! 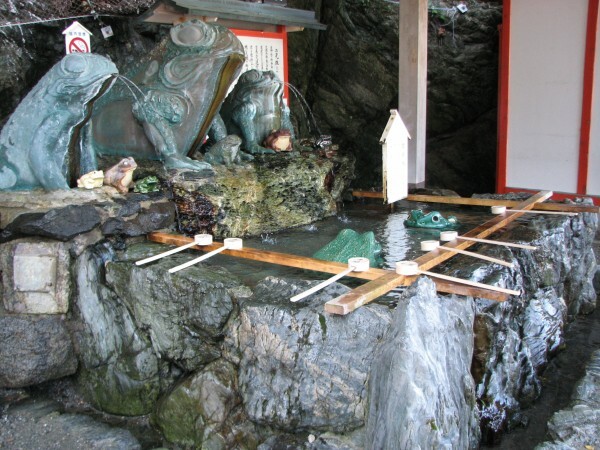 Another item of interest is a tiny red shrine in front of a small cave. Ameratsu, goddess of the Sun, is supposed to have hidden in this cave for a while. I then went to Kashikojima, in the south of the Ise peninsula, from where one can take a boat to visit Ago Bay. 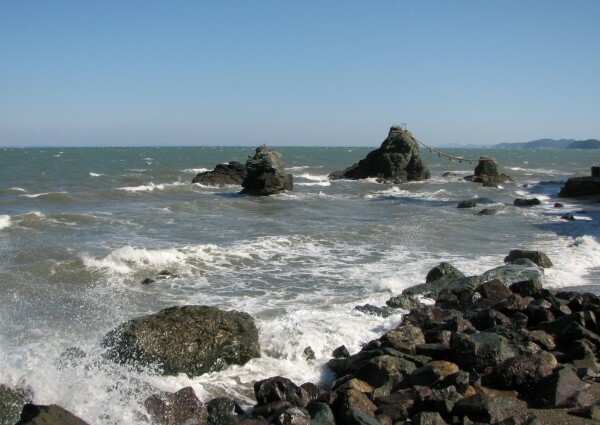 I have some pictures of the bay I will post soon.